Looking for Laser Hair Removal In Melbourne Fl? We have the most advanced and painless technology. Laser Hair Removal In Melbourne Fl. When you are looking for Laser Hair Removal In Melbourne Fl look no further than Achieve Beautiful Skin. The technology we use has made us the premier medi spa on the Space Coast, and laser hair removal is a large part of that. Our equipment is the most advanced and powerful on the market, meaning better results for you all while being totally pain free. Emvera DioLux Laser Hair Removal System has made permanent hair reduction easier than ever. Men and women, alike, are removing unwanted body hair without pain and recovery time. Achieve Beautiful Skin is proud to be the only Medi-Spa in Brevard County Florida using the Emvera Diolux Fast and Pain-FREE Laser Hair Removal System. The DioLux is the fastest, most powerful and comfortable laser for all skin types on the market. The 808nm diode operates up to 10 pulses per second, speeds capable of treating women’s legs or men’s backs in eight to ten minutes. The Emvera has a powerful chilled tip cooling system to minimize pain and reduce the risk of burning. At Achieve Beautiful Skin we are proud to use the Emvera DioLux that uses a high-powered diode laser that pulses up to 10 pulses per second. Laser beam wavelengths are delivered in a uniformed way to ensure treatments are more effective. The laser damages the hair shaft and bulb, reducing its ability to grow. The result is permanent hair reduction in the treated area. Since hair follicles normally go through periods of dormancy and they need to be active when treated, it is necessary to come back for more than one treatment. Six to Eight treatments may be necessary for effective hair reduction. If you have tried any hair removal solution such as waxing, tweezing or electrolysis, you will marvel at how painless our Emvera Diolux Laser is. 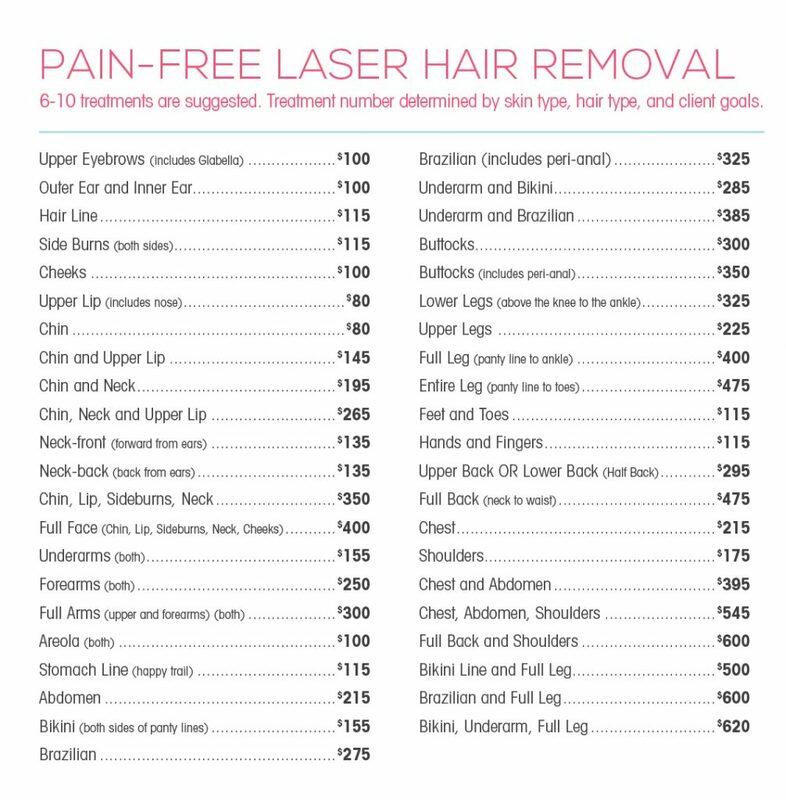 Any of the methods mentioned above is more aggressive, damaging and painful than a laser hair removal session with our laser. We apply a gel to prepare the skin for treatment. Emvera Diolux Laser is equipped with a cool sapphire tip. Most patients return to normal activities immediately after treatment. This is a no-downtime procedure. Yes, it is. The hair that is killed during a laser hair removal session is dead and will never grow back. The Emvera Diolux Laser is capable of giving over 90% permanent reduction for ALL skin types both male and female. However, don’t forget that you have a lot more hair on your body than you probably imagine (hair grows in cycles so you actually never get to see all your hair at any given time) and it takes multiple sessions to kill 80-90% of this total hair. Another thing to keep in mind is that your body, as long as you are well and alive, will produce new hair. This process will continue despite laser hair removal and the growth of new hair is actually why you need touch up sessions once or twice a year. Are there any side effects and is it safe? At Achieve Beautiful Skin MediSpa, safety is a constant goal for our laser hair removal treatments. Our Medical Aesthetician is highly trained and our technology is the most advanced. It is possible that the laser will cause slight redness that will dissipate soon after treatment. If the follicle is large in size, bleeding may occur and is quite normal; it will look like tiny red dots, this is a positive sign that the laser found its target. All side affects are temporary and are healthy reactions to the high heat of the laser. How long do I wait between sessions? The recommended time between treatments with the Emvera Laser is six weeks, because we like to catch the majority of your hair in its growth cycle. Keep in mind everyone is different and the times will vary; check with your Electrologist. How should I prepare for each Laser Hair Removal treatment? Avoid sun exposure at least two weeks before treatment. Do not bleach, pluck or wax four to six weeks before and after treatment***. Wait for tanned skin to fade before beginning treatment. Always wear a dependable sunscreen of 30 SPF or higher. ***Your hair needs to be as short as possible for this treatment to be effective. We recommend that you shave the day of, or the evening prior to your appointment. Since we will cover the entire area in each of your sessions (except for touch-up sessions) we do not actually need to see the hair. Shaving it removes the surface debris and allows the laser beam to penetrate and destroy the root, as it should. Treatment times vary depending on the size of the area as well as the amount of areas being treated. Once the gel is applied, the underarms usually take less than 45 seconds each. The Emvera Diolux is amongst the top fastest lasers on the market today and is capable of speeds much higher than your laser administrator will ever need to use. However, high speed can negatively affect the amount of hair follicles. This is where the Emvera Diolux differs from other lasers; it is able to function at high speeds with no change to its effectiveness. When can I expect to see results? How do I know it is working for me? You will see results starting with your very first session. The hair growth will be less and the hairs finer and weaker; your skin will become smoother; and the hair follicles on your skin will become less visible after each session. The results will become more impressive with each following session. The number of treatments required will be based on your hair color and type, body area and skin type. Will I have hair between sessions? What will I look like? Your treated area will be cleared of most of the present hair during the treatment, while the rest of the treated hair will shed in two weeks leaving the area smooth and clean. Depending on the area, the skin will remain clean and smooth for around 6 to 8 weeks in total, starting with the treatment date; and the time for your next session will be when you see little fine hairs growing again. By repeating the sessions on time the area will remain hair free throughout the entire multiple session procedure. Electrolysis is permanent hair removal approved by the FDA. A licensed Electrologist must perform the procedure. The treatment consists of applying an electric current to one hair follicle at a time, which destroys the root. Laser hair removal uses a small device that ultimately generates heat, which is what severely damages and burns the hair follicles by the root. This causes some clients to notice the smell of burnt hair, and why the skin can look and feel like a mild sunburn the day after treatment. I have ingrown hairs. Will Laser help? Absolutely. Even after one treatment you will notice that most of your ingrown hair will be terminated. After the treatments we advise you to treat your skin with care for the next 24 hours. Taking showers with hot water, sweating excessively, rough exfoliating or products that contain a lot of chemical ingredients should be avoided since they can cause itchy, sensitive skin. Once sensitivity has subsided, you can return to your daily habits with no danger whatsoever. Can I choose to achieve finer and fewer hairs in certain areas rather than full removal? Yes! We can customize your treatment according to your needs and expectations. We can weaken and reduce your hair in any area while still leaving a desired amount. How do I choose the best Laser Hair Removal treatment provider? What makes one better than the others? Qualifications of the Electrologist, etc. According to the Florida Board of Medicine, laser hair removal may only be performed by Electrologist, Advanced Registered Nurse Practitioners, Physicians Assistants and Medical Doctors trained in that specialty. If you’re unsure just take a look around the administrator must have their credentials displayed. Experience and Proper Training of the Laser Administrator. Most people will look to the business location’s name for recognition and credibility. If you are selecting someone to point and shoot a high-powered laser at your body, you should look into their recognition and credibility as well. This field is constantly evolving and the equipment is highly advanced. Continued education is vital to a safe and effective treatment, regardless of how high the administrator’s degrees are. All humans are capable of error; be sure that your laser administrator is doing everything possible to prevent it. Laser hair removal treatments at Achieve Beautiful Skin are performed with the Emvera Diolux Laser. Purchased in late January 2015, we are proud to say it is currently the only one in Brevard County! The Emvera Diolux uses a brand new, patented technology that places it in a category all it’s own. Most lasers, including the Emvera Diolux, will promise you: “The Fastest Treatment Time, The Most Pain-Free Experience and the Highest Rate of Effectiveness.” We scoured the market and the Emvera Diolux is the only laser that has actually delivered on those promises. Come to Achieve Beautiful Skin MediSpa Viera and feel what real FAST and PAIN-FREE Laser Hair Removal ACTUALLY feels like!!! Emvera DioLux Pain Free Hair Removal FAQs. Emvera DioLux laser hair removal system has made permanent hair removal easier than ever. Men and women, alike, are removing unwanted body hair without pain and recovery time. You, too, can have smooth and silky skin quickly, effectively, and pain free. Emvera DioLux is a revolutionary system for permanent body hair removal. Removing hair from any part of the body has never been so fast or more pain free. Emvera DioLux uses state-of-the-art technology to safely remove the unwanted hair with unbelievable speed. Small areas of the body can be treated in as little as 30 seconds. Larger areas are quick and painless, too. Finally, you can have both legs done in one visit! The Emvera DioLux uses a high-powered diode laser that pulses up to 10 pulses per second. Laser beam wavelengths are delivered in a uniformed way to ensure treatments are more effective. The laser damages the hair shaft and bulb, reducing its ability to grow. The result is permanent hair reduction in the treated area. Since hair follicles normally go through periods of dormancy and they need to be active when treated, it is necessary to come back for more than one treatment. six to ten treatments may be necessary for effective hair reduction. The final result is exactly what you want – permanent hair removal. Results will vary per treatment, but the end result will always amaze you. There are many different skin types, hair types, and other factors that can affect the number of treatments needed for results. The Emvera DioLux is the most powerful and comfortable laser hair removal system on the market. It is adjustable to treat light skin or dark skin with minimal redness after the procedure. There are also adjustments for fine or course hair and light or dark hair. The treatments are unbelievably quick and painless and the results are amazing..
You can have silky smooth skin from treatments on your lunch break! The Emvera DioLux, can remove hair from small, delicate areas, such as the face, brow, upper lip, and neck in as little as a few minutes. The smallest areas can be completed in as little as 30 seconds. Larger areas are quick and painless, too. You can finally have all of that hair removed from your husband’s back in five to seven painless 10-minute sessions. Yes. Thanks to Emvera DioLux ‘s efficient light beam delivery and soothing a sapphire tip, permanent hair removal is pain free. During your treatment, a sapphire-cooling tip glides across your skin as the laser is pulsing on the hair follicles. The sapphire tip provides a cool feeling on contact with your skin. The hair follicles are the only thing damaged, causing them to not grow. The skin is kept cool and comfortable. The result is pain free permanent hair removal. Emvera DioLux is safe, quick, and effective. Most people do not experience any discomfort during or after the procedure. Some notice a very mild sensitivity, irritation, or redness after the treatment, but this lasts only a day or two. Eyes stay covered during the treatment to prevent possible exposure to the laser. The risks are limited and there is usually no recovery time. You can have a treatment on your lunch break! Men are self conscious about their body hair, just like women. The most common complaint about hair on men is back or neck hair. Men no longer have to suffer with embarrassing back hair, neck hair, chest hair, or any other unwanted hair on their bodies. The Emvera DioLux will treat an entire man’s back in 10 minutes. Results will vary, depending on the skin and hair type, but after a few quick and painless treatments, results will be unbelievable. Women are always trying to look their best. To many, this means shaving, plucking, waxing, and other means of removing hair temporarily. Maintaining smooth and silky skin was a chore before Emvera DioLux laser hair removal system. Now, women can stop in for a quick and painless visit without interrupting their busy schedule. Emvera DioLux has revolutionized laser hair removal and allows men and women everywhere to enjoy smooth, silky skin.